Ninety-five percent water and lacking complex organ systems, jellyfish still manage to navigate the world’s oceans and thrive. 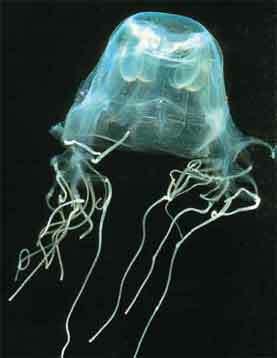 Cannibalistic species usually have long trailing tentacles with specialized stinging cells to paralyze prey. 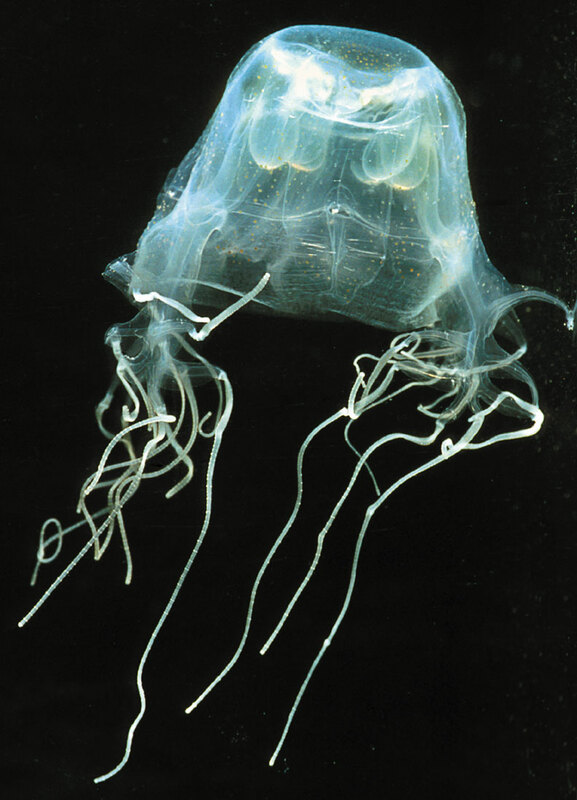 Other species strain microscopic organisms from the water column and lack elongate tentacles. 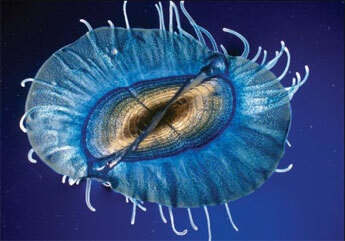 On earth for more than 650 million years, jellyfish were here before the sharks and dinosaurs. 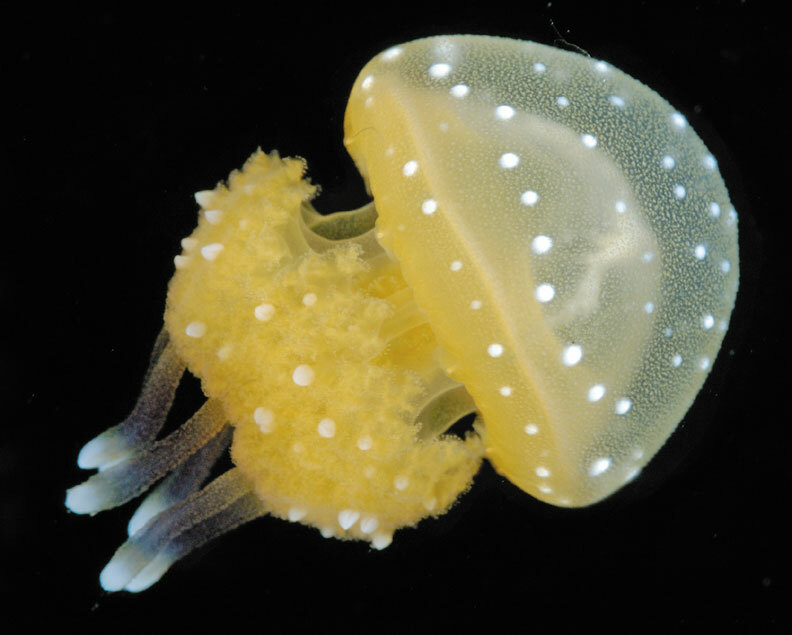 Ranging in size from those visible only under a microscope to individuals with diameters larger than washtubs, the sea jellies are important members of coastal and marine ecosystems. 703 East Beach Blvd., Ocean Springs, MS 39564. She agreed to share several of the photos from her guide with us. Click the photos to see the jellies larger. 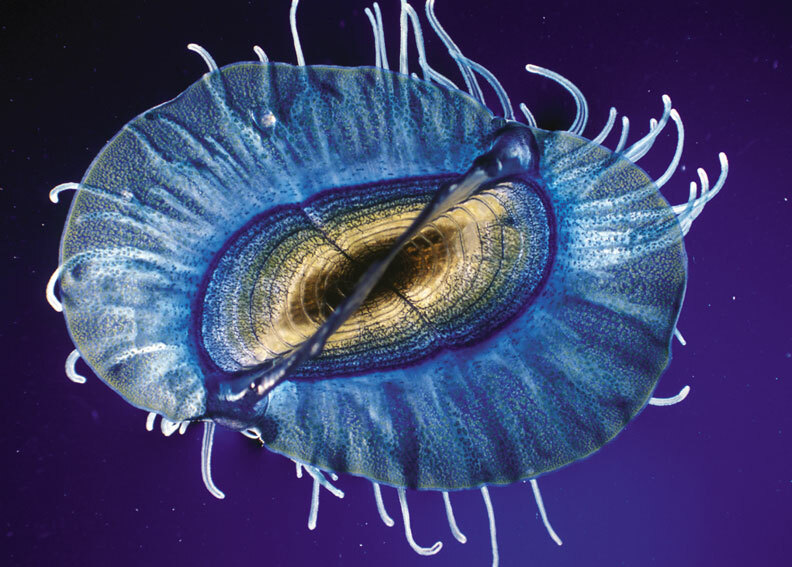 Velella velella (left): a free-floating colony of individuals, this by-the-wind-sailor is an occasional visitor to the waters of the northern Gulf. With their deep blue disc and triangular “sail,” they are propelled over the sea surface like tiny sailboats. They can occur in great numbers and when blown ashore they form an amazing blue driftline along the beach. base from which the tentacles are suspended. Phyllorhiza punctata (left): an exotic species from “down under,” the Australian spotted jellyfish invaded Mississippi waters in the summer of 2000 in the hundreds of thousands. Arriving as small tennisball sized individuals, they soon grew to washtub size weighing over 25 pounds. Filter feeders, they strain tiny plants and animals from the water column and there was some concern that they were feeding on the larvae of important fish and shellfish in local waters. 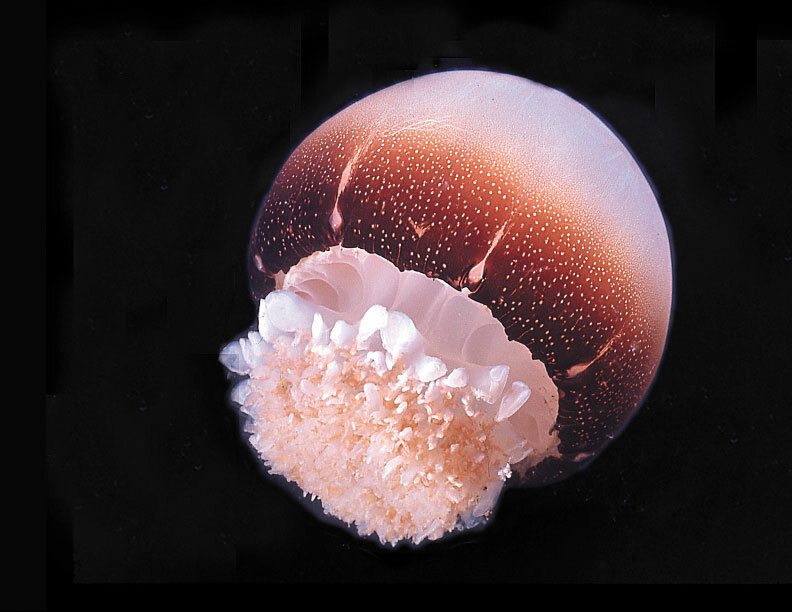 Stomolophus meleagris (right): near soccer-ball size, the cannonball jellyfish is a common sight in the winter and spring. 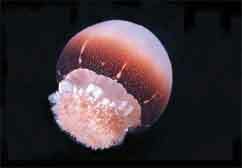 With their thick, pulsating bell, they move rhythmically and rapidly through the water, seemingly with purpose. Often abundant near the barrier islands, they clog shrimp trawls making them difficult to haul in. Dried, salted, and cut into strips, they can be purchased in local Asian markets and are often used in salads. 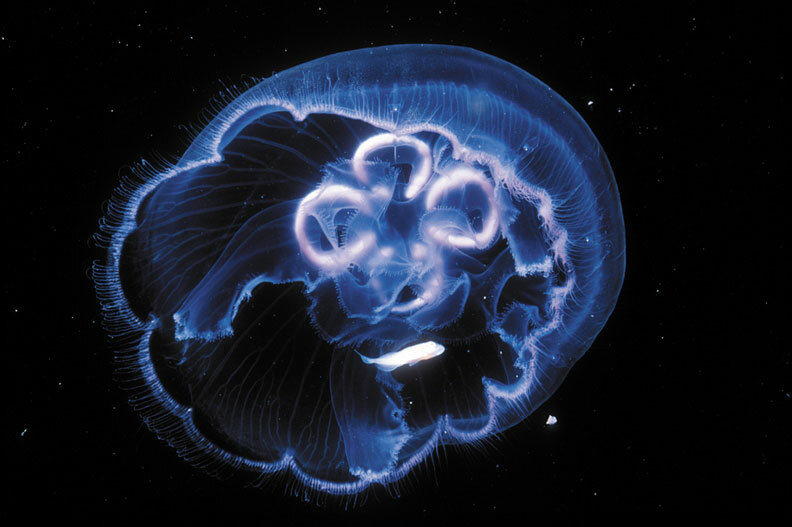 Aurelia aurita (left): moon jellies seem to float as serenely as their namesake. Dinner platesized, they have a flattened disc, thick at the center, that tapers to a delicate edge fringed with short tentacles. Mature individuals have four, pink horseshoe-shaped gonads arranged around the center of the disc. These non-threatening summer visitors often occur in large numbers. The Gulf Coast Research Laboratory is a public, non-profit research facility dedicated to working toward a future of sustainable marine and coastal resources through scientific discovery, development of new technology, and education of future scientists and citizens. Begun in 1947 by the Mississippi Academy of Sciences, the Gulf Coast Research Laboratory has been part of The University of Southern Mississippi since 1988.